There is no better way to get the kids to put down their tech and rejoin the real world than by setting up a family camping trip. But if you’re like me, the word ‘camping’ sends shivers up your spine. Call me cowardly but I like my creature comforts: hot coffee that doesn’t taste like boiled dirt, a bed that doesn’t come with rocks, and a screen door between me and the mosquitoes that seem to love me oh so much. Still, the family that camps together, stays together. If you can survive five nights in a tent or two, you can survive anything. There are a few tricks that can make the whole experience more palatable for those of us who are thoroughly citified and think that ‘serve yourself’ continental breakfast is the hotel equivalent of ‘roughing it’. 1. Forget packing the big cotton towels that NEVER dry for the campground shower! Find some small microfibre towels at your local camping store. They are small, soak up a lot and dry within an hour! 2. Do you prefer solid soap leaves to a bottle that you need to drag around? Use a vegetable peeler to shave off leaves from a bag and store them in a baggie! And don’t forget some hand sanitizer for those times when washing hands the regular way is just a little too far in the dark. 3. No need to pack bulky tubes of toothpaste! A few days before leaving, put dots of paste on a sheet of wax paper and let it dry. You can lift up the dots and put them in a baggie. To use them, just dissolve a dot in a bit of water and brush away! 4. Toilet paper is essential, but the space the rolls take is too so remove the cardboard tube, flatten the rolls and place them in a ziplock bag. Waterproof and squishable, put them in whatever corner is left in your car! 5. If space is at a premium, this would be a great time to dig out the vacuum sealer that you bought five years ago and never used. Vacuum seal a couple of meals in advance. You can just pop them in your pan and dinner will be ready in a flash! Need meal ideas? Stew, chilli, basically anything that is a one pot meal. You can also seal various other things you’ll need including condiments, pancake mix, and more! 6. Are you a fan of fresh breath? Great! Eat Tic Tacs and keep the boxes! They make excellent spice, salt and pepper holders! 7. If you like scrambled eggs in the morning, don’t worry about carrying a load of fragile eggs with you. Simply pre-crack your eggs and pour them into a plastic water bottle. One standard bottle will hold eight eggs. Add some salt and pepper, close and shake: instant scrambled eggs that are easy to transport in your cooler. 8. Can’t function without your morning coffee? Take a paper coffee filter, put one cup worth of coffee in it, pull up the sides and tie it shut with dental floss. Just put it in your mug, pour boiling water over it and let it steep. Be sure not to use the mint dental floss, unless you like something a little extra gross in your coffee. 9. Add flavour to your charcoal grill by putting fresh rosemary on your coals. Once they are grey, they will smoke flavour your burgers or steak. 10. Forget the pasta and get the kids used to couscous. You just need equal parts semolina couscous and boiling water. Mix, cover and let sit for five minutes. Voila! You can add chickpeas, soup mix, pieces of red pepper or whatever else you like, to flavour it up a little. 11. And for dessert, there is nothing easier than campfire Banana Boats! Trust me. Scrumptious with a capital S! 12. Freeze gallon jugs of water to use in your cooler instead of ice packs. As they melt, you’ve got drinking water! You can also do this with the large tetra-pack juice boxes. Apple juice anyone? 14. Wet matches = no dinner so make sure you store matches in a small tupperware container and glue a piece of sandpaper to the lid, for striking them. 15. Old pill containers or mint tins are great for tiny kits: tiny first aid, tiny sewing kit… Whatever you need to bring that is small and easy to lose! 16. Create light that is safe by placing that head lamp that your spouse insisted on bringing around a filled water jug, light facing in. It will create an ambient light that will make a tent cozy and safe – no flames! 17. The interlocking foam tiles that your kids stopped using three years ago and that have been in the basement ever since make an excellent floor for the tent. They even out rocky soil and make it easy to sweep out the extra mud and muck that everyone drags in. 18. Need to start a fire in a jiffy? Corn chips make a great fire starter base and can serve double duty: you can use what’s left to make pan nachos. Don’t forget the salsa! A family camping trip with a few extras to up the comfort factor could well become an annual tradition that your kids start clamouring for in March. So get ready and go for a week of fun in the woods. Don’t forget the sunscreen and bug spray! Do you have any camping hacks to share? I love learning new camping hacks. Wow I love some of these hacks! Especially the mini kits! Some great tips, we camp all the time so some of these will definitely come in handy. My idea of campings way different then yours LOL, even my tent camping had real coffee, the minature toothpaste and travel toothbrush, eggs, steaks, potatoes, veggies, you name it. Bu generally its been no to camp fires…most of the years we went there’s always been a ban on. We’ll be going camping in aug which I am really looking forward to again this yr, but this time its just the two of us, which is going to feel slightly weird I think. Wow, been camping my whole life and never heard of the tooth paste pr the lamp on frozen water jug, now that’s genius! Thanks for the awesome camping hack! We love camping and love to take our grandchildren as well, they love to come to the camp. we have an awesome time. Lots of great tips. I learned a lot. Isn’t that a great idea? I have been breaking eggs all these years. Great tips! 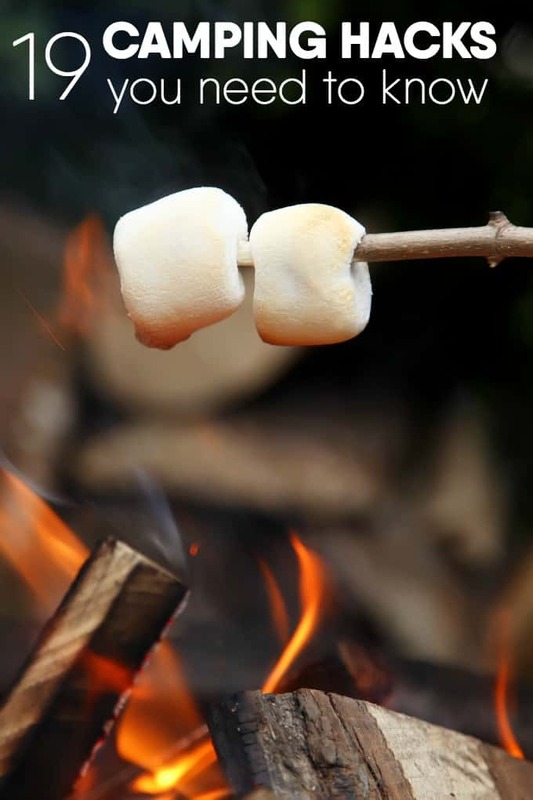 I love camping, thinking of a roasted marshmallow right now!